I am shifted from Bhuj to Patan in year 2013. At that time really we were not expecting much birding place around the Patan. After spending some time at Patan, we surprisingly found many birding locations and many birder friends, one of them is Mr. Haresh Pandya. He is enthusiastic member of the Flycatcher group. They are exclusively do birding in Banaskantha district of north Gujarat when we chat first time on FB. During that chat we decided to visit the Dantiwada dam site for Bar-headed Goose. The bar-headed goose is one of the world's highest-flying birds. The bar-headed goose migrates over the Himalayas to spend the winter in parts of India from Assam to Tamil Nadu. The modern winter habitat of the species is lakes, reservoirs of dam and sometimes beside cultivated fields, where it feeds on barley, rice and wheat etc. When we reached at the dam site we saw waders and water birds along with Bar-headed Geese. Sadly they fly away at the opposite side when we approach them. In return we decided to search them. We found them and they were just 200 m away from us. This time silently we crawled towards them on rough ground. At one point we reached very close to them when they were unable to fit in our camera frame...! We went back and got some awesome shot of Bar-headed Goose. 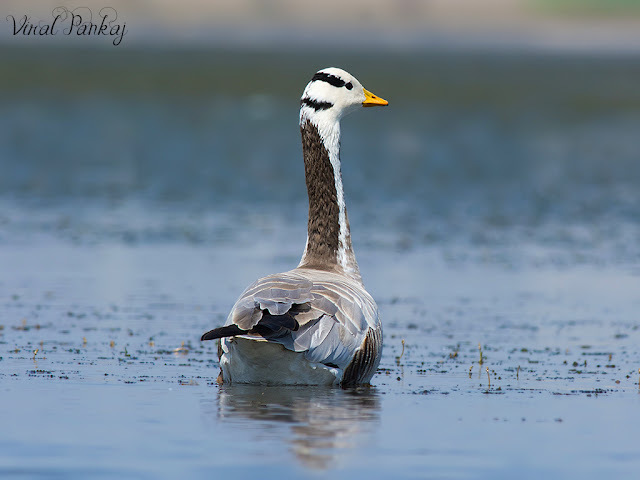 The Guajarati name of Bar-headed Goose is “Raj-hans” means king of goose and they are truly looks elegant like the King.